Microsoft today unveiled its major announcement at a press event in Los Angeles. Microsoft unveiled its own-branded ARM Windows 8 tablet named Surface. The Surface tablet is just 9.3mm thick, weighting 1.5 pounds. The tablet also features a built-in stand, twin 2×2 MIMO antennas for WiFi, and a Gorilla Glass 2 display. 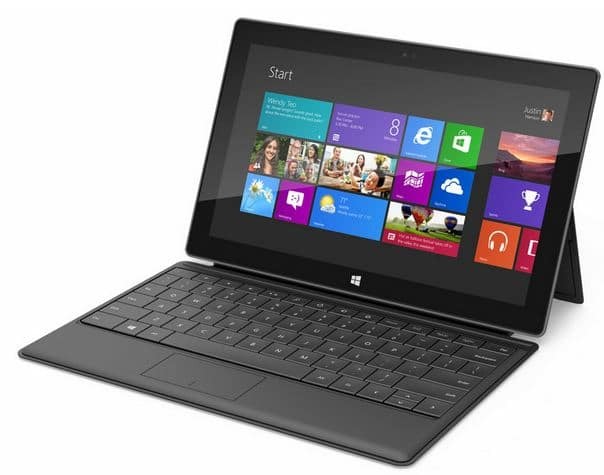 Microsoft Surface runs on Windows 8 RT, and includes a full multi-touch keyboard and trackpad. As for connectivity, the tablet features HDMI, USB 2.0, and microSD with either 32GB or 64GB of storage. You’ll also see front and rear cameras.